I have designed a lead which can be used as an ordinary lead also. This lead is useful for a dog that is getting elderly and needs a helping hand or after an operation when they might be a little unstable. (eg. If needing assistance going into the garden for a wee). Older dogs tend to get a little bit rickety as time gets on and sometimes it can be a little bit of a worry when you are walking your dog that if something should happen, how would you get your dog home again as comfortably as possible. This lead is ideal as you can use it as a normal lead everyday knowing you will never get stuck with your dog in a collapsed state on a walk. Accidents can and do happen. Our own dog Molly, broke her leg on a walk. 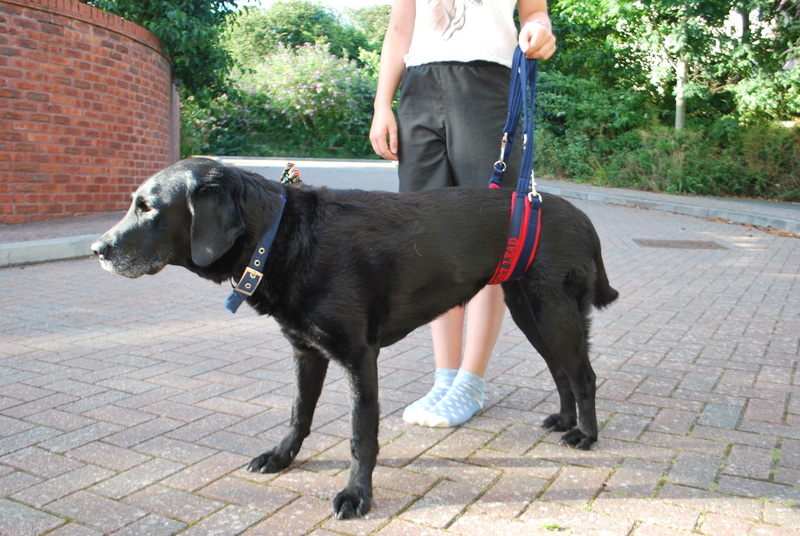 So it isn’t just older dogs that have trouble walking back home or to the car, a lead that could be useful if incurring an injury whilst out on a walk. Carrying a dog home is exhausting as well as worrying. You may be at the stage where you know your dog needs a little bit of help for some of the walk and therefore want to still give him the enjoyment of being on a walk but helping take the weight off his paws. If your dog is happy on a walk but gets a little tired, then this lead may be an option to try. The lead has been made with flexibility in mind – so you can try different means of attaching the handles as seen in the picture to help you help your dog more effectively. Slide the lead under the dogs tummy making sure the fleece is making contact to the tummy. The lead has two handles which means you have the option of holding both handles in one hand with the supporting belt underneath the dogs tummy. 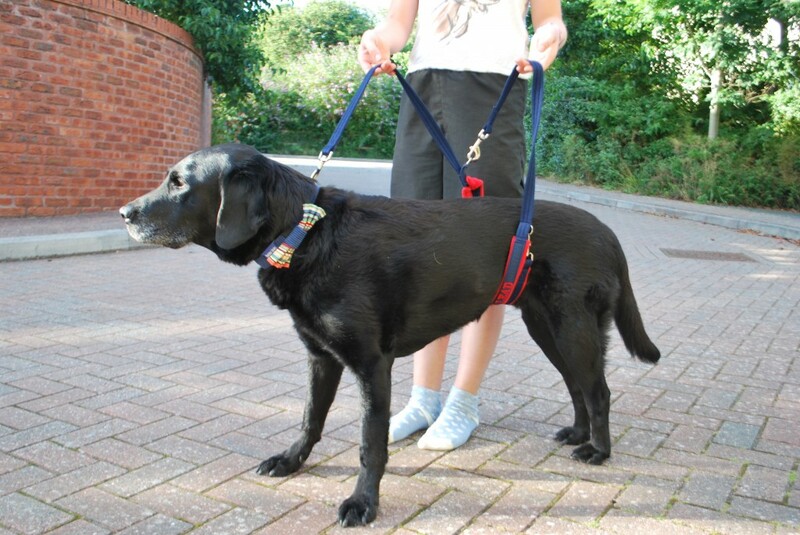 The other option is for two people to help hold and support the dog, by holding a handle each. This is particularly helpful for larger heavy dogs. 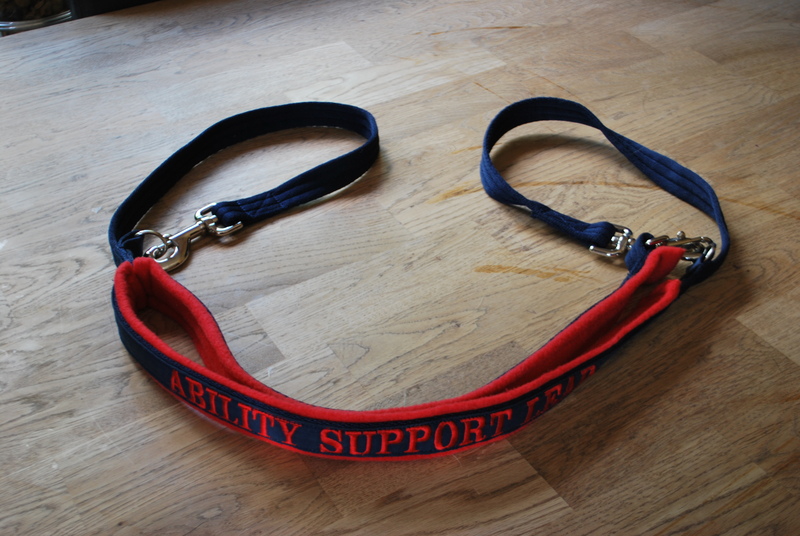 You can also unclip a handle so that you can clip it on to the dogs collar so you can provide some direction and support from the front, unclip the two padded belts so that you can loop it as a singular band under the tummy to create support for the rear end of your dog. NB – it is important to have the fleece making contact with the tummy rather than the other side of the supporting belt as this could create pressure sores. To use the lead as a normal lead, just unclip one handle and clip it the dogs collar. This lead can be purchased from Tillymint Dog Designs. A good quality product that WILL give you peace of mind. Copyright Held by Heidi Mitchell.